by Caroline Robertson, Ayurvedic consultant Cert Ayur; ND; Dip Hom; DRM; Dip Bot. Med. Need to spice up your life? Bored with the same old tastes and aromas? 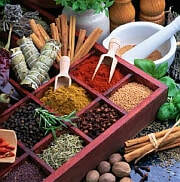 Spices not only add a distinctive flavor to food, they also have impressive health benefits. So instead of popping pills when you feel unwell first consider how you can use food as your medicine. If you’ve got the runs, try nutmeg. Nausea? Chew on ginger. Feeling bloated? Favor fennel tea. To savor the variety of medicinal spices available create your own kitchen pharmacy with the following essential spice elixirs. Asafetida’s one of those rare foods that smell weird but taste great. Sulfurous compounds in this resin give it a distinctive garlicky aroma. Also known as hing, this yellow resin is most commonly sold as a powder generally mixed with turmeric and wheat. I think of it as the “great bloat banisher” due to its unprecedented power to absorb gas from the body, flush out fluid, and neutralize gaseous foods in cooking. For millennia, Indian mothers have massaged their baby’s colicky tummies with 1/5tsp roasted asafetida and 2 tbs warm sesame oil, and were delighted when the pain and crying rapidly dissipated. Asafetida is also effective for painful periods, asthma, and arthritis. For this it is taken as a mixture of equal parts cumin seeds, ginger powder, black cumin seeds, ajwain seeds, and rock salt. Try 1 tsp twice daily before meals with warm water or more frequently with persistent pain. The easiest way to cook with asafetida is to throw a pinch of powder in with your beans, nuts, veggies, or grains. This will not only add a rich oniony flavor but will quieten any uncomfortable after-dinner rumblings. A sweet seed often added to desserts, cardamom gives one a sweet breath and voice. Called the grain of paradise, cardamom was once one of the most valued exports of South India. It is not only delicious but bears medicinal properties that make it indispensable to any kitchen dispensary. Added to sweet curries, desserts, dahls, and curries, it will help to clear the passageways of mucus and to reduce gassy indigestion. Given with ginger, it is credited with stimulating the appetite and reducing nausea. Recent research also indicates that it may aid the body to detoxify from caffeine and codeine. Used in cooking, you can bruise a green pod, fry it, and add to savories, or for sweets add the powder, seeds, or raw crushed pods. To help strengthen the respiratory system and eliminate coughs and colds, try this...: Traditional Chai Tea Recipe: To 4 cups of boiling water add 5 bruised cardamom pods, 2 cinnamon sticks, 2 peppercorns, 6 slices of ginger root, and 2 basil leaves. Boil down to 2 cups. Cool and serve with honey or palm sugar. This is also a tasty and therapeutic alternative to caffeinated drinks. A spice used extensively in Ayurvedic and Chinese medicine, cinnamon is the perfect ingredient to add to your warming winter dishes. The Egyptians used cinnamon as a preservative for embalming, and the Portuguese valued its tangy taste so much that it inspired several expeditions. Cinnamon is a suitable companion to cardamom in sweet dishes or drinks. The sourness of stewed fruit is disguised by the addition of cinnamon and cardamom. By itself, however, you can’t beat cinnamon sticks or powder to charge the circulation and warm backache related to chilled kidneys. You can apply it by making a cup of boiled water with 1 cinnamon quill or 1/2 tsp cinnamon powder steeped in it for 5 minutes. A few drops of clove and cinnamon essential oils are effective painkillers when applied directly to toothache. Also used to settle hiccups, try a pinch of cinnamon and 1/4 cup of apple cider vinegar to ease the discomfort. English tradition of hanging oranges studded with cloves in cupboards. The ideal clove is black with a thick stem and a closed bud, which stimulates the taste buds with its spicy pungency. Clove buds are often cooked with rice dishes whereas the powder is better in vegetable dishes. For sore throats and coughs, you could take a pinch of clove with 1 tsp of honey three times a day or inhale the steam of 7 cloves in 5 cups of boiled water. also a popular remedy used by naturopaths against worms and amoebas.